Check our the branch website! 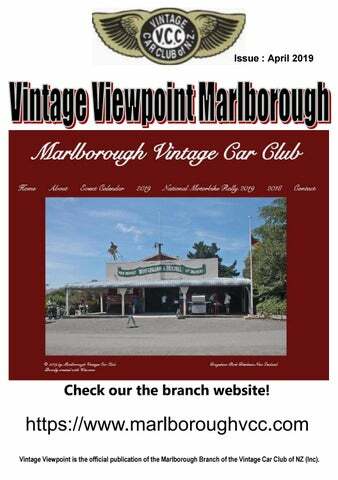 https://www.marlboroughvcc.com Vintage Viewpoint is the official publication of the Marlborough Branch of the Vintage Car Club of NZ (Inc). We have a vehicle display at this year's Air Show and require 40 vehicles, these must be pre 1965. First in will get 2 tickets for 2 days. We require vehicles for both Saturday Sunday. Those accepted will need to be at the gate at 08:30 where tickets will be supplied please come in through right hand lane to airfield. Patrick Pascoe on p.pascoe@xtra.co.nz or TX on 0274421786 I will reply with acceptance. Please Support Our Advertisers they are supporting Your Vintage Viewpoint! Chairman’s Report First let me thank Bill and his team of helpers for clearing out the museum and getting it ready for the painter. As you can all see it has tidied up the walls and the floors a good job well done. After the carpet is done we will move to the outside with painting and tidying up the signs etc, this will cost a few dollars but we have over the last year or so put aside money knowing that all this had to be done sometime. found out prices were about $100 each. Kelly was talking to Earl and Rose one day, and this came up. Rose went onto Trademe and in quick time, found two lots of chairs, about 50 in total for $2 or $3 each. So, a great vote of thanks goes to Rose for this effort. We tried to thank Earl, but he said there was no point thanking him as he didnâ&#x20AC;&#x2122;t even know how to turn the computer on! Linda Laing has set up a Website for the Branch. It is at http://www.marlboroughvcc.com Go and have a look, and any suggestions would be gratefully received. Some of you would have seen Lindaâ&#x20AC;&#x2122;s photos on line in the past. There will now all be on our website. Our branch AGM is coming up on Sunday 19 May. Elsewhere in the Viewpoint will be information about this, and nomination forms. If you are at all interested in the running of our great branch, please consider putting yourself up for election onto the committee. Locally Owned and Operated Trade & DIY Supplies for •Quality Dulux & British Paints •Ashley, Vision & Exclusive imported wall coverings •Marine & Industrial Coatings •High Grade Auto Finishes •Flooring •Giftware …And advice you can rely on! Brief report on discussion at VCC Executive meeting in Wellington on 23rd March. One that is very interesting is the Registrars report which outlines the VCC interaction with other historic motoring clubs throughout the world. There is real concern, coming from the Europe countries about the foreseeable banning of our types of vehicles from public roads because of the use of Fossil fuels and perceived pollution, where there is a HUGE push for all to be electric or hybrid vehicles on our roads by 2040, and some countries and manufactures are heading for this by 2030, only 11 years away. Unfortunately, where Europe goes, NZ will follow, so the VCC being the historic vehicle authority in NZ needs to be and are aware of this and are being proactive here to see this does not become law in NZ. There is a copy of this on the notice board, but if you want a copy let me know and I can print off or email it to you. On a positive note, after over an hourâ&#x20AC;&#x2122;s discussion and debate, the Executive have passed a resolution, that there will be a separate National motorcycle Rally in 2021, which will be hosted by the Wairarapa branch. This was going to be incorporated into the Vero International Festival of Motoring being held in Taranaki in January 2021, but there had been a huge pushback by motorcyclists, and wisdom prevailed. It was interesting to note that every branch voted for this change, with 5 votes against coming from some of the management committee. We had a presentation from the Rally organisers of the Vero International Festival of Motoring. Things are progressing with most of the rally routes have been sorted. There will be 4 days motoring and 1 dayâ&#x20AC;&#x2122;s static display all based in New Plymouth in January 2021. We need to make an effort to publicise this event to our members, and flyers will be coming out soon. 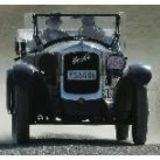 The website to go to make an early indication of registration is http:// www.historicmotoring.co.nz/ Also, on here are details of two accommodation providers who are offering discounted accommodation to rally entrants. This is a very brief resume of what was talked about from 10am to 5pm. General Business Members please bring a plate for afternoon tea at the conclusion of the AGM. Ads that work are ones that include a photo of what you are selling. If you don’t have access to an electronic photo bring me a photo you have and I will scan it for you. It is important you advise the Editor when you no longer need the advert to run. VCC Heart Defibrillator AED Mobile App There have been suggestions that the recently purchased Heart Defibrillator should be listed in the mobile phone AED app. However this Defibrillator is only accessible when the Club rooms are open and then it may have been taken along on a Club rally run hence is not available 24/7 for Public use. To have it included in the AED app would only cause delay & confusion if a member of the Public tried to access it. According to the App, a Defibrillator is available at the Marlborough Museum 24/7. FOR SALE - CARS 1950 Morris 6 WOF’d with new Rego Sound original Car, goes very well, in daily use. Last Owner has had it 42 Years! Hillman 10 1939 In good condition. Older wooden trailer, Steel tow bar in good tidy usable condition. Concrete mixer with electric motor. Plenty of work left in this unit. 1951 Morris Minor restoration project. complete and was running nicely when removed from car. A nice unit $500 can be viewed at the shed. Adult $47.00 Children $25.00 Motorcycle $40.00 Car/Van/Trailer up to 5.5 metres $124.00 Trailer-Each half metre over 5.5 metres $20.00 Premium Plus Lounge $55.00 18yrs plus Off Peak Travel Dates 01 March – 17 April 19 24 April – 15 December 19 Peak Fares: Each Way Adult $52.00 Children $25.00 Motorcycle $50.00 Car/Van/Trailer up to 5.5 metres $137.00 Trailer-Each half metre over 5.5 metres $22.00 Premium Plus Lounge $55.00 18yrs plus Peak Travel Dates 01-28 February 19 18-23 April 19 Booking conditions and instructions for members are: • Each reservation must be made direct with Interislander online using the special link below– • https://www.greatjourneysofnz.co.nz/interislander/ book/fares-anddiscounts/group-bookings/. • To access these rates members must insert the reference “WH5465” • Payment is required at the time of booking. • Space is subject to availability at the time of the booking request. • Refunds Once paid for fares are 90% refundable if cancelled prior to check-in and non-refundable if cancelled after check-in. • Fares valid for specified dates only • Members are required to present their current NZ Vintage Car Club Membership credentials on check in or retail fares will be charged. Fares valid for travel 01 February through to 15 December 19 No discounted fares for travel 16 December 18 through to and including 31 January 19 Bookings over this will need to be made online.